Roat Osha is a casual, yet dramatic Thai restaurant located in Uptown. By combining authentic Thai culinary techniques with an American flare, visitors will have a dining experience that will delight the taste buds. I don’t know if I’ve ever digressed on Minnesota Munch about how much my fiance and I enjoy Thai food. You know how Mac and Cheese, lasagna or a hamburger are usually the top foods that come to mind when “comfort food” is mentioned? Yeah, my fiance and I think a little differently. If we are having a bad day or, when in the depth of winter, we just need something to soothe our psyches, we instantly search out Thai food. The spicy, hot chilies, peanut sauces, and garlic just hit the spot! If it’s not Thai food, we’re looking for Indian. 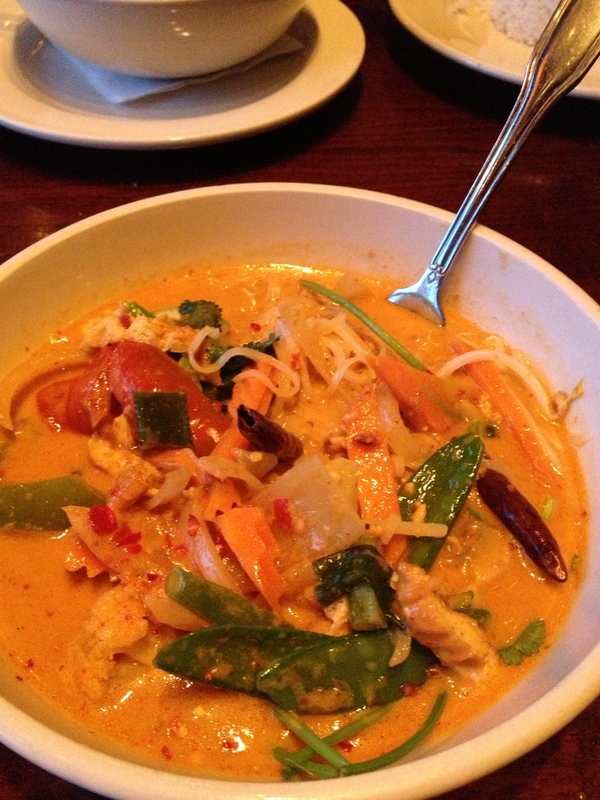 Good thing we have access to many decent Thai and Indian places within the Twin Cities Metro! To those who haven’t been to Roat Osha, you should really check this place out. Not only is the food amazing, but they have a fun and trendy atmosphere with touches of traditional Thai/Southeast Asian artwork. We just couldn’t stop staring at the models of Thai ships or elephants. The intricate craftwork was simply eye catching. Here’s another reason to love this place; they have a bar area if you aren’t feeling dinner and an outdoor patio for the warm summer months. I don’t know about you, but any place with a patio is okay in my books. We started with the Appetizer Platter. 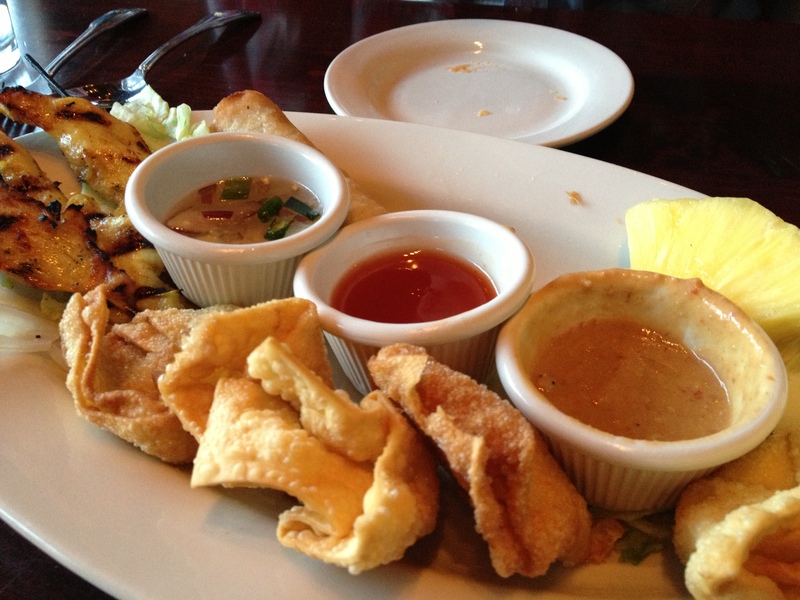 This includes three Chicken Satays, four cream cheese wontons, and three spring rolls. The chicken satays were marinated with Thai spices and grilled; and, they were served with a homemade peanut curry sauce and a sweet cucumber sauce. Literally, these are great for any guy who wants his meat. Plus, the peanut sauce was AMAZING with the chicken. I would actually order just an appetizer of these. The cream cheese wontons were like any other wonton: deep fried and filled with warm, delicious cream cheese. Lastly, the spring rolls consisted of ground pork, glass noodles, and vegetables. Since my fiance really enjoys his meat, I didn’t order the vegetarian kind this time. These were still a great app. and went well with the three sauces on the tray. The last sauce you see in the picture (the red one) was a basic sweet and sour. He decided to get the Massamun Curry, mainly because he was craving a curry-based dish with chicken. According to the Roat Osha menu, this is a dish from southern Thailand. When you order the curries here, you can choose between a vegetarian option, which would include cauliflower, carrots, broccoli, onions, and mushrooms; or you can choose from a meat option, which includes chicken, pork, tofu, mock duck, beef, shrimp or squid, scallops, and a seafood combo. Talk about giving you options. Feeling adventurous, I went with the Mee Kah Teeh. The base of this dish is rice noodles with red curry. The vegetables are all added later to preference. At Roat Osha, they use red curry sautéed with rice noodles, egg, peanuts, garlic, and bean sauce. This Tum Rup Thai original is served with bean sprouts, fried chilies, scallions, cilantro and lime. Honestly, I thought this was perfect. It had a good amount of heat and a punch of flavor. Also, my serving contained a delightful balance of noodle to veggie ratio. Just look at this picture and tell me you don’t want to have a taste. Mee Kah Teeh: red curry sautéed with rice noodles, egg, peanuts, garlic, and bean sauce. Served with bean sprouts, fried chilies, scallions, cilantro and lime. At this point in our night, we were so full that we had to refuse dessert. Sad, I know, but filling up on the entrees, appetizers, and drinks were well worth it. Speaking of drinks, I forgot to mention what we ordered. I’ve listed them below. I’d definitely recommend the One Night in Bangkok. This was very refreshing and went well with the apps we ordered. One Night in Bangkok: A cosmopolitan is made with UV Citruv, Triple Sec, cranberry juice and Rose’s lime juice, garnished with a lemon twist. Bangkok Sunrise: This lemon drop martini is served in a sugar-rimmed glass, with UV Citruv, orange juice, sour, and a drop of grenadine, garnished with a lemon wedge. 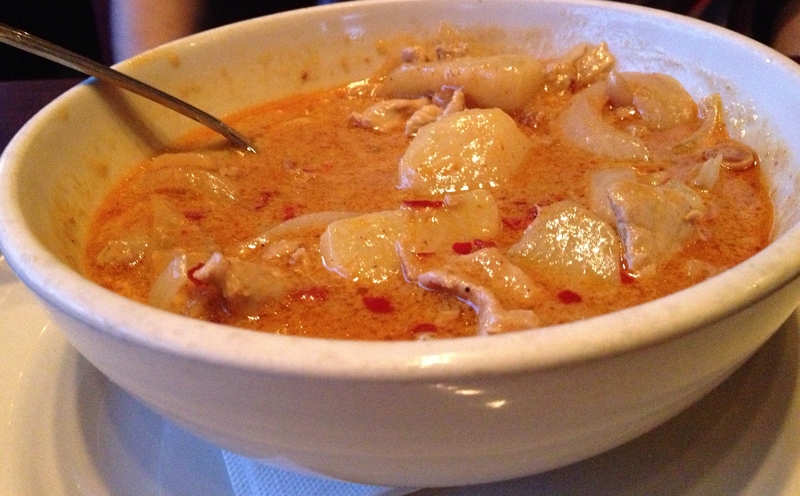 Roat Osha is definitely the place to go for some amazing Thai food in Minneapolis. If you’re in the mood to try something new, you will not be disappointed. Happy Fourth Of July from Minnesota Munch!